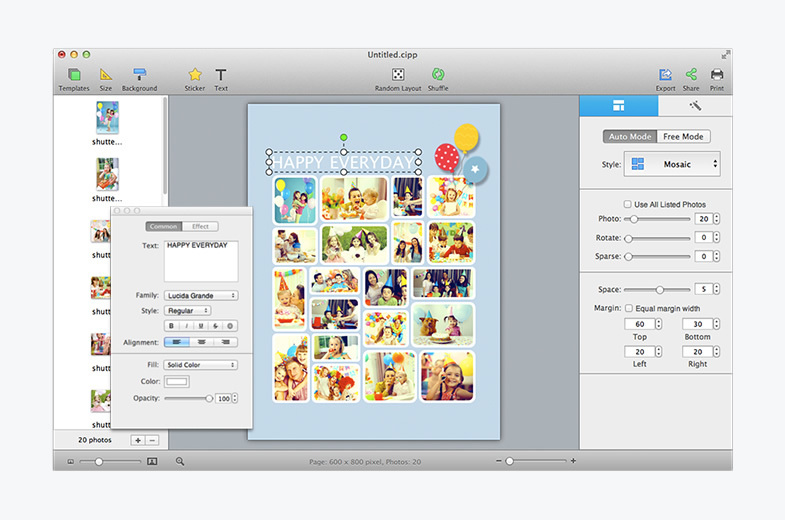 With only three steps, you’ll create photo collage automatically; easy enough for users of all experienced levels. 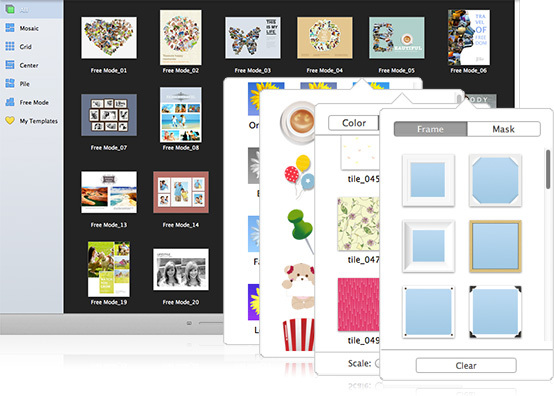 Five collage styles for making photo collage - Mosaic, Grid, Center, Pile and Free Mode. Various collage layouts can be generated continuously. Intelligently fit photos to collage with face recognition when generating layout. Real-time preview with a super high speed. Large photo capacity supports adding up to 200 photos. 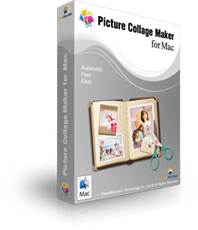 60+ brand new templates to make various style of photo collages on Mac. Apply photo effects/filters, collage frames& masks to beautify your photo collage. Add and customize text in real time to make your collage standout. Add stickers and resize, rotate, flip, etc. at will. 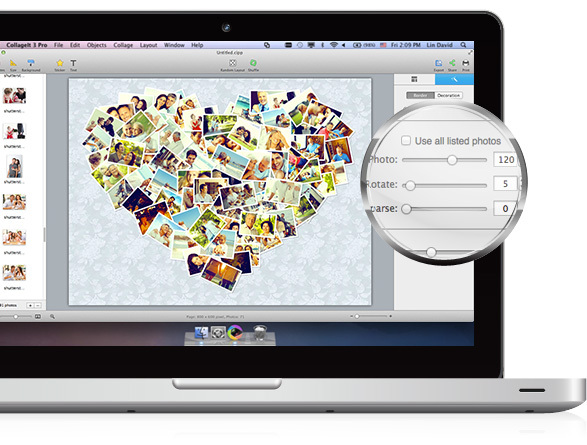 Choose from 50+ background patterns, or load your own image as background tosuit your collage. Apply photo border and shadow for decoration. 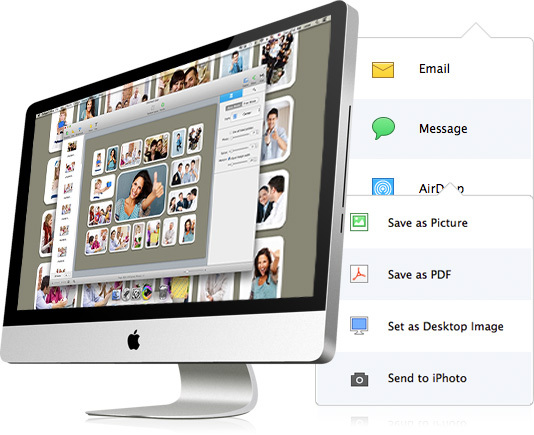 Add photos directly from iPhoto. 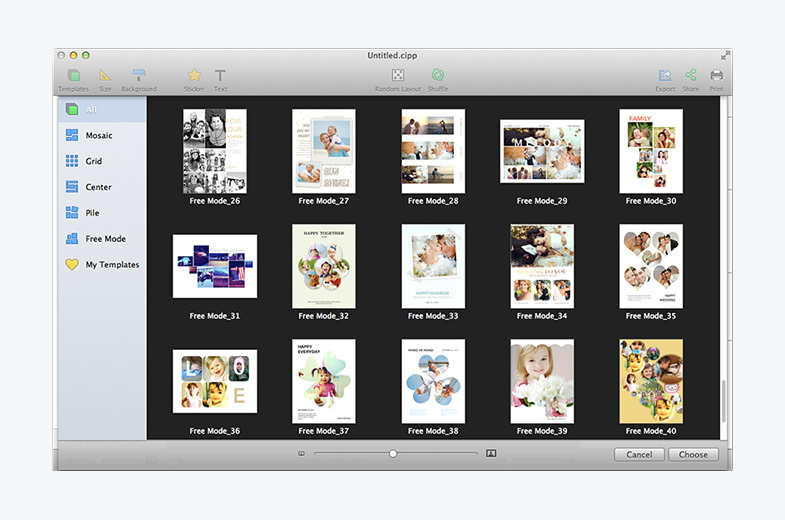 Arrange photos in order under Grid mode. 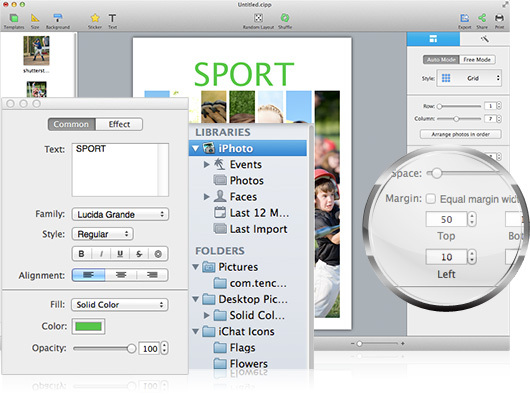 Switch to Free Mode to move, resize, and rotate each photo manually. Crop/uncrop photos to meet all your needs. Support selecting multiple objects and editing them at a time. Set the margin of Top, Bottom, Left, and Right respectively. Save the collage as JPEG, TIFF, BMP, PNG, or GIF, etc. 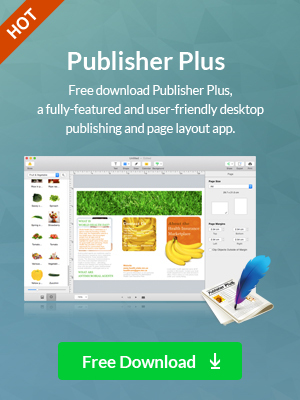 image format and print it out. Set the collage as desktop image. 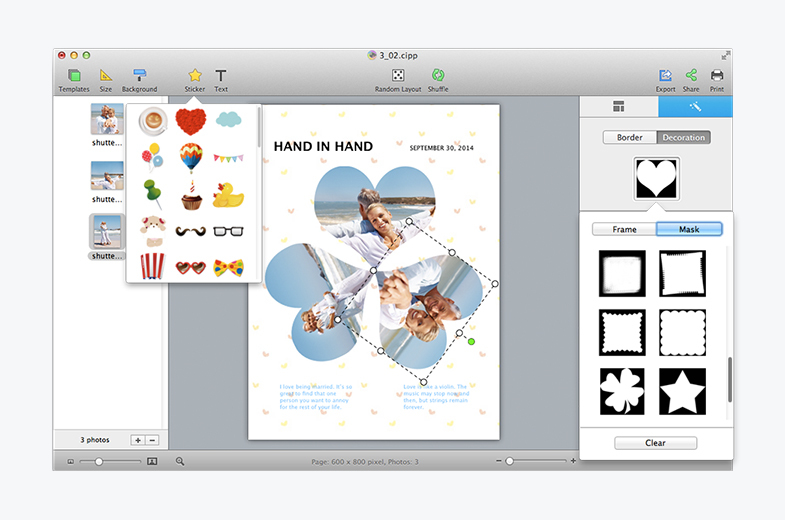 Save the collage as a PDF file. 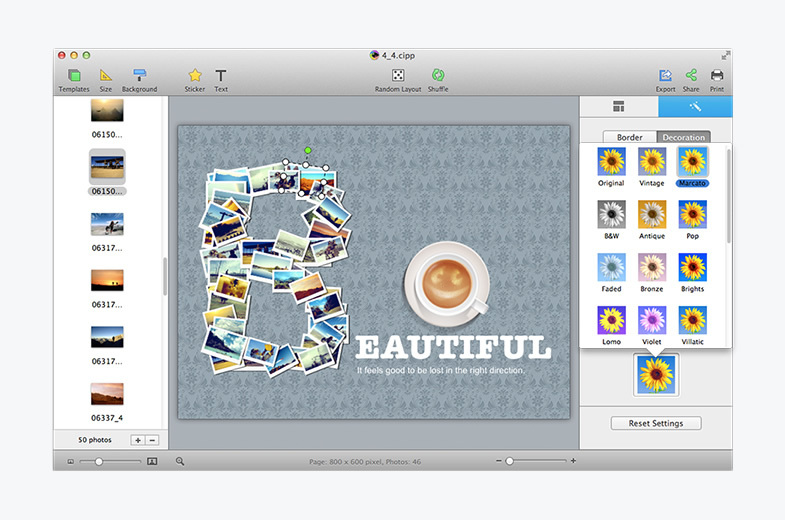 Share the collagedirectly on Facebook or via E-mail, iMessage, AirDrop, Twitter, and Flickr with family and friends. Save the collage as project and open it for further editing. It's a great photo collage software! 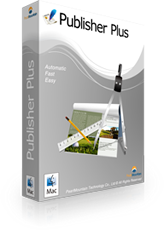 A very, very fast and simple photo editor.